Concrete for paths, driveways, patios and all outdoor areas is no longer just a cost effective alternative to paving. 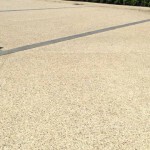 The popularity of Exposed Aggregate Concrete has increased significantly in recent years as home owners and businesses seek a modern stylish finish to their outdoor areas which is achieved by the natural appeal of the exposed stone aggregate. Wide range of colours and aggregates to suit any home or business style. Exposed concrete is an excellent option if ants and weeds are a problem. Unlike bricks and slabs, exposed concrete is one large solid area which weeds cannot penetrate. 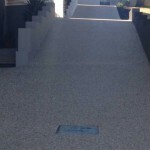 The appearance of exposed aggregate concrete is achieved by spraying off the top layer of concrete to expose the colourful rocks beneath. Please contact our professional and experienced team today for more information.